The furore over phone hacking has once again put Rupert Murdoch’s proposed takeover of BSkyB into the spotlight. In the past, many people, including both me and Vince Cable’s fake constituent, might have assumed that Murdoch already owned Sky. So how did it come about that he only owns part of it? 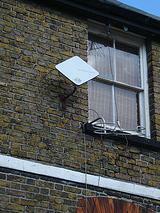 The answer is that BSkyB was formed by the merger of two rival satellite broadcasters. In the ’80s, companies bid for the licence to operate satellite TV in the UK, and the winner was a consortium calling themselves British Satellite Broadcasting (BSB), with Rupert Murdoch losing out. The authorities placed quite stringent conditions on the new broadcaster, and the whole scheme was rather ambitious and costly. They had to launch their own two satellites, Marcopolo 1 and 2, to transmit the signals. They decided to use a more compact, square antenna known as a “Squarial”, rather than the conventional-looking round dish. The broadcasts were made using a superior standard, which included digital sound, and would have enabled widescreen and high definition pictures. The programming was also of a high quality, with a dedicated highbrow arts channel. Murdoch, however, had a trick up his sleeve. Through his acquisition of European satellite broadcasters, he was able to launch his Sky TV service, which was carried by the existing Astra satellite. Although the content was regulated like other British TV stations, Sky had none of the other restrictive conditions of BSB’s licence. The service was broadcast using the standard PAL system, so didn’t require specialist hardware to decode the signal, and was received using the round satellite dishes that became synonymous with council housing in the early ’90s. The programming was, shall we say, rather more populist entertainment than that offered by BSB. For reasons I don’t quite understand, Sky suffered from poor advertising sales. BSB, meanwhile, struggled with the costs of their expensive set-up. Within a couple of years, the two companies merged, with the resultant entity known as British Sky Broadcasting, or BSkyB. Murdoch therefore only had a part share in the company. In terms of operations and programming, though, it was effectively a take-over by Sky. The new service was branded as Sky, the Marcopolo/Squarial system was phased out over the next few years, and most of the former BSB channels were closed. Former Sky customers never received the arts channel, and it was soon closed for BSB subscribers too. It’s worth thinking about what might have happened if both services had continued. Increased competition could only have been good for consumers. Maybe it would have driven up standards in programming. Most significantly, Sky may never have become as dominant as it is now, and may not have been able to outbid all other broadcasters when it came to sports rights, for example. But sadly that wasn’t to be, and the Squarial went the same way as Betamax video and HD-DVDs. And if Rupert Murdoch has his way, he’ll soon finally be in the position he wanted to be in the late ’80s: owner of the UK’s only satellite TV broadcaster. BSB started broadcasting in March 1990, and by December 1990 the plug was being pulled on two of the five BSB channels. A third was turned off in early 91. British Satellite Broadcasting was a total disaster. Its a shame it failed, the government should have done more. Just think, we could all be watching BSB digital.